I consult with a lot of parents, usually about undesirable or concerning behaviours. I’m also a parent of 5 children myself and know that lots of our interactions with our children are focused on stopping negative behaviours, as opposed to giving them positive feedback when they are doing the right thing. In fact, if you really think about it, we don’t pay much attention to our kids when they are being good at all. The idea of addressing naughty behaviour is of course a sensible one – if your daughter bites another girl at the park, you need to intervene and provide some intervention to correct the behaviour. However, when your daughter then goes back to playing, and starts doing the right thing – that is, not biting other kids – what reinforcement is there for the good behaviour? Generally, not much at all. Many parents whom I consult with say to me that they have tried using reward charts to manage their children’s behaviour. I then await the next bit of news that I know is coming – they stopped using the chart after a week or two because, despite some initial success, it stopped (or wasn’t) working. Of course, there are many reasons why these reward programs may not work, but the most common ones I find are usually to do with issues about application from the parents end: parents forget to notice and reinforce their child’s good behaviour, parents use the reward program as a punishment (by taking away or withholding rewards), parents aren’t clear of the aim of the program, parents use the reward as a bribe (i.e. “Max, if you eat your dinner you can get a sticker”), parents don’t offer enough reinforcement (i.e. 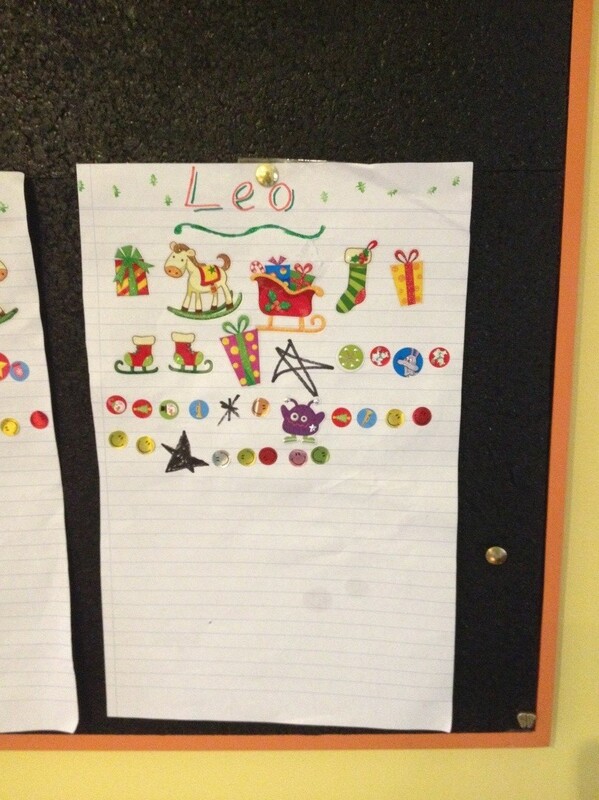 only one sticker on the chart per day) and parent’s fail to recognise that they need to make some big changes too. Question: What is positive reinforcement? Answer: This is an often misunderstood scientific term that describes the process whereby the likelihood of a particular behaviour occurring again increases following the application of something that has been rewarding to (in this case) the child. A caveat – the child must find the reinforcer to be positive! For most small kids you won’t really have to work too hard at this, as the excitement of the program and of getting a sticker on their chart is rewarding enough in itself! You can keep them engaged in this excitement by asking them to put the sticker on themselves, or by getting them to occasionally count their stickers and tell you how many they have, or count them together if they can’t count as yet. Question: How long should we run the program? Answer: Remember a time when you have tried to break a habit or change some behaviour: it usually takes more than a week or two! Changing our child’s behaviour can be difficult, but it is certainly not impossible. Essentially, you have to be ready to commit to the program for a few months. It is very common for reward programs to stop after a few days, simply because the parents forget to use the program consistently. Your commitment to remember to reward your child will mean the difference between success and failure with this strategy. This means that you have to catch them being good many times every day. A day of forgotten reinforcement, especially at the start of the reward program, will also be very unhelpful. For the first week or two it is vital to be consistent, day-in and day-out, noticing as much positive behaviour (i.e. the absence of naughty behaviours) as you can. It is also very important for both parents to communicate with each other and commit to the same parenting strategies. It is no good for mum to focus on reward charts if dad does not agree with the use of them. Children are experts at divide and conquer, and they will certainly find the gaps in any parenting strategy that you use. Talk to each other, agree on the approach and then stick to it! The last point is one of perseverance – do not give in. Behaviour generally gets worse before it gets better, so be prepared to hang in there for the long haul. Question: How do I set up the chart? Answer: There are no real requirements with this – in fact it is limited only by your creativity. As long as it is easy to use, and your child can understand where they are up to. Involving your child in the design and construction of it really engages them in the program, and can be the ideal way to start. You can use a simple poster and stickers or stamps, or a jar and marbles, or a plastic sleeve and raffle tickets – have a look online for some other great ideas. Have a look at page 4 for some pictures of different types of reward chart. Question: How many times a day should I try to reward behaviour? Answer: We really have to catch them being good as many times as we can. Any instance when your child is not engaging in an inappropriate behaviour is an opportunity to provide them with some positive reinforcement – a ruffle of the hair, a smile, a pat on the back all coupled with some positive feedback are fantastic incidental ways of reinforcing positive behaviour. An average of 6 positive interactions to 1 negative one is a general aiming point for all parents. This doesn’t mean that we give them a sticker on their chart every time they are doing something good, but rather that we notice their behaviour and give them this feedback. It is important that your child buys into the program – that is, that they feel like they are having some success. To achieve this they initially have to experience a higher dose of stickers than you may feel comfortable doing. We initially want to make it very easy for our kids to achieve a sticker, so in the first week or two we may actually put 10 stickers on the chart at random times throughout each day. We also have to make sure this is mixed with lots of other incidental reinforcement – i.e. : positive feedback. As time goes on we slowly taper this off so that by the 4th week they may be receiving only 5 stickers a day, and the 8th week maybe only 1-2 stickers a day: but we still have to focus on noticing lots of positive behaviours and giving them the incidental reinforcers (kiss, pat on the head etc). Question: Do I need to set any focus behaviours on the reward chart? Answer: A focus behaviour may be something like “Brush your teeth”, or “get dressed by yourself”. 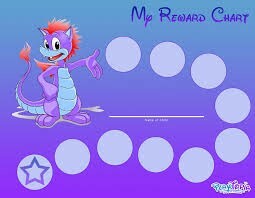 You actually do not need to have any particular focus behaviour for the reward chart to work. In fact, I argue that by having specific focus behaviours you may start to limit the opportunity for your child to earn a sticker. I believe its best that the program is structured in a way that is not limited to certain behaviours, as you then don’t tie yourself into a corner. You also don’t fall into the trap of using the reward chart as a bribe to get things done – this will lead to a failure of this strategy. If you do want to focus on certain behaviours my advice would be to have only 1 or 2, as well as making sure that any other positive behaviour can and is still rewardable. Behaviours you want to stop should not be the expressed goals of the program – rather the focus behaviour should be worded in a way which is about what the child can do or should do. For example: “Mark will not punch his little brother” focuses on negative behaviour and may be quite tricky to reward – that is, if Mark pushes his brother but doesn’t punch him is this OK? Mark will argue it is and may wonder why he doesn’t get a sticker because he actually didn’t punch his brother. “Mark is being a gentle boy” is a much more positive and hopeful goal. Any time Mark is gentle offers the possibility of positive noticing or a sticker on the chart. Think carefully about how you word the focus behaviours, and make sure that they are not so specific that the child can only possibly earn one reinforcer for it per day or even week. Having the goal “William will eat all of his dinner” can only be rewarded once per day, and only if they eat all of their dinner. You may also start to use the absence of a reward as a punishment (“all right, there are no stickers then”) which is the beginning of a hostile interaction, not a positive one. If you change the focus to “William will be cooperative” you can reward this behaviour multiple times per day, but you may focus especially on this around meal times. The more global the focus, the more times that the general behaviour can be reinforced, the more likely it is to increase. Question: Can we use a fine for negative behaviour? Answer: No. Once a sticker is given, it cannot be taken away. Question: What is an appropriate reward? Answer: Here we have two categories: the immediate reward that represents your reinforcement to the child – such as a stamp or sticker on the chart, and the delayed reward that may be claimed when a certain target is reached: e.g. every 10th sticker they receive on their chart. Offer only small and realistic rewards (depending on age of course) – e.g. you may make up some laminated cards that have certain bonuses written on them that they can trade in any time such as a night off their normal chores, going for a milkshake with mum or dad, playing the Wii with dad, or something else fun. You may also have a collection of small lucky-dip type prizes that may only cost between $1-$5. NOTE: buying your child computer games, large toys and the like is specifically not recommended. Using these expensive items as rewards negates the effectiveness of simpler, relational rewards such as a pat on the back, time with mum and dad and so on. Make them achievable, but not easy to get – for example – every 10 stamps means they will achieve it relatively quickly at the start of the program, whilst 100 stamps may be too hard in which case they may give up. Question: Can rewards be used as bargaining chips? Answer: No – this is called bribing! Using rewards as bargaining chips encourages your child to do the behaviour for something, which is not desirable. Instead, always give reinforcers/rewards following a positive behaviour, without too much verbal comment, and try not to refer to them before the child earns them. It may be ok to say “I wonder who will earn some stickers today”, but not “whoever picks this toy up off the floor will get a sticker”. This means that it is much more effective to catch your child being good and then reward them. In this sense they are being rewarded not only for their good behaviour, but also the initiative and drive to do it by themselves. If we use the bribe method, the child’s reward has been contingent on your prompting – which means they will not learn to initiate the behaviour themselves. When putting a stamp, sticker or tick on the chart, you do not need to draw verbal reference to it every time – it can be more powerful for you to just walk up to the chart (in their presence), and add the reward quietly, but proudly. Question: Is it possible to reward too much? Answer: Yes it is. In the first week you really should try to overdo the positive feedback and stickers – they need to feel drawn into the program. Give them a few opportunities in the first 2-3 weeks to earn the larger reward – if their goal is 10 stickers to earn the bigger reward make sure they get at least 5-10 stickers a day in the first 1-2 weeks. You don’t need to give them a sticker for every little positive behaviour you see – your reward chart will actually be much more successful if you make the stickers a little more random (think of a poker machine – they are so addictive because any time you pull the handle you might win the jackpot – they very successfully use the principle of random reinforcement). This also helps you get in the practice of noticing positive behaviour. The danger with a reward chart lies not in rewarding too much, but in not slowly tapering off the number of rewards you offer. If you do not slowly taper off giving a large amount of stickers every day, then the child’s behaviour becomes contingent on the reward – this is not what we want. Our aim is to slowly decrease the number of stickers they are receiving randomly over the course of about 6 weeks so that we get to a point where it may take 1-2 weeks to get to 10 stickers. By doing this, we are encouraging the child (without their realising it) to generalise their good behaviour to other settings, without the need of reward. Question: How do I reward my child when they are not doing the right thing? Answer: There is always some positive behaviour that you can reward, even if it is the absence of negative behaviour! We can use positive reinforcement to change our children’s behaviour through what we call “shaping”. Shaping is essentially about having appropriate and realistic expectations for individual children. For example, if we expect a child who generally doesn’t eat their dinner to sit there and eat their dinner, there will be no opportunity for them to receive any of the natural or structured rewards because more than likely they won’t eat their dinner! No reward means change is difficult. We need to actually think about “what is the next best thing they could do on the road to our broader expectation”? It may be that just sitting in the chair picking up their fork and eating a mouthful is the next best thing that child could do – if you can see that they are making any effort to go even a little bit beyond their normal behaviours, then that becomes an opportunity to give them a sticker on their chart. Next meal time (breakfast) if they eat all their food then we should also reward that with a sticker, because they are demonstrating success at the table, which we want to reward (even though it’s not dinner). By doing this we are breaking down our expectations, reducing the level of conflict and giving them some small motivation to continue this behaviour at the next meal time. We don’t need to make a big song and dance around it we may just say “I thought you did a great job at dinner tonight and I’m going to put a sticker on your chart!” If they don’t deserve a sticker, don’t even label it – i.e. don’t say “You can’t get a sticker tonight honey because you didn’t try with your dinner” – this is using the absence of the sticker as a punishment, which won’t make them feel good about the program. When you’re shaping try not to give really specific feedback, as we don’t want them to think that all they have to do is eat one small portion. We want to give general feedback about their attempt – “that was a great try, good boy”. After a few nights of this we think again – what is the next best thing they could do now – it may be eating all of a smaller portion of dinner – if they do this then we go through the same process of rewarding. And this process goes on until the child is doing more or less the behaviour that we desired. The real trick is to make sure you can adjust your expectations without communicating any underlying sense of frustration and anger. This is a very basic, but user friendly and easy way of doing a reward chart. For this child, every 8 stickers they receive a small lucky dip type surprise (like a new set of pencils, some craft things, a new book to read etc.) which is represented by the star. This child would earn 8 stickers over about a 1 ½ to 2 week period: this is a sign that they are well into the reward chart program. In the first weeks of this program the child would have received 8 stickers in 1-2 days, plus lots of other incidental positive reinforcement (i.e. lots of noticing of good behaviour). As time goes on, the child also sees a page full of stickers – which is something for them to be proud of! This type of reward chart is nice and neat, and looks quite engaging for a child but does have limitations. These charts can trap parents into not offering enough stickers, as there just isn’t enough space to record many. If you do use these charts in the first few weeks you may go through one of these every day or two! 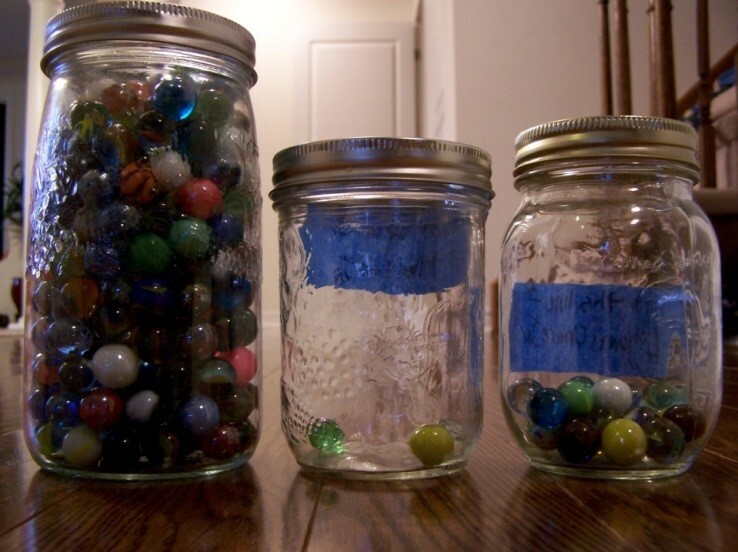 Using a jar and marbles is a great way of representing a reward chart – the sound of that marble going in can be heard throughout the whole house – kids will love it! In this example, you may draw some lines on the jar to indicate when they have achieved a certain level of reward, as is mentioned above. While this is very pretty, the drawback is that a reward is linked to doing a task. What happens if the child doesn’t do their task? They don’t get rewarded. But as parents, we really want to reward them so the risk is we may start to “bribe” them in order the get the program going – “if you go and do your job you can get a sticker”. There is also no space to reward any other positive behaviour they may be doing.